The PocketGPSWorld.com GPS Event in Basingstoke seems like a long time ago now but it is only 2 weeks. Quite a few products were launched at the event one of which was the Globalsat SD-502. The Globalsat SD-502 is a GPS receiver which contains 512Mb of memory as well. This allows you to have your map data on the SD card overcoming one of the problems of the original SD-501. Now devices like the XDAII can use the SD-502 in a useful manner as previously any maps had to be held on the PDA memory, now they can be saved to the GPS SD card. We have been eagerly awaiting the launch of the Globalsat SD-502 since our GPS Event at the Celtic Manor in Wales where Tom Thompson won the first SD-502 GPS in the prize draw. Unfortunately it took a long time to productise the prototypes, but it would seem that the wait was worth it. Globalsat UK and Easy Devices were on tenterhooks during the run up to the PocketGPSWorld.com Basingstoke GPS Event as the shipment of devices was wending its way from Globalsat Taiwan to Edinburgh. They did of course turn up just in time and sold like hot cakes at the show. As you know, we made use of the Basingstoke event to launch our new SD-502 GPS receiver. This was a thundering success, with a mass of interest in this innovative new device. We certainly see any future PGPSW exhibitions/meets as being a very suitable venue for new product launches. Giving the end-users the first sight of devices such as the Globalsat SD502 is a perfect way of market testing a products popularity. "We see the SD502 as quite possibly the biggest step forward in GPS technology this year. People have been waiting for this device for a long time and in true Globalsat style, we are first to meet the demand. Forever innovative, always at the front line of GPS technology, Globalsat pride themselves in meeting the increasing demands of the GPS user. The team at Globalsat UK were overwhelmed by the interest in the product at Basingstoke and were truly encouraged to see the excitement of those who knew what a tremendous leap in technology had been made with the production of this device." 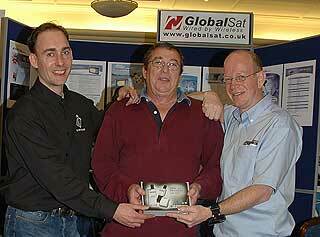 Tom Thompson receives the first Globalsat SD-502 in the UK from Sean Wood of Globalsat UK. The Globalsat SD-502 in my HP iPaq hx4700. At PocketGPSWorld.com we have been testing the Globalsat SD-502 for a while now and think it is a cracking little receiver. We are currently in the middle of preparing a review of the receiver which will be published very shortly. In the mean time check out the press release and specifications from Globalsat below. 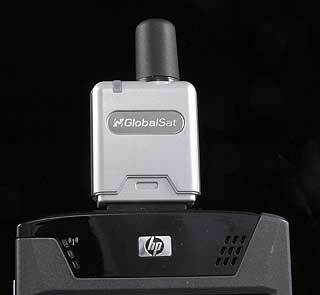 Globalsat introduced the World’s first SD GPS receiver in 2004. This year Globalsat have updated the technology and included on-board memory for maps and applications. Using the latest SiRFstarIII III GPS chipsets this new GPS boasts stunning performance, along with low power consumption. Globalsat’s SD-502 is the next generation of integrated GPS receiver with memory that offers a combination of non-volatile storage and navigation capabilities in a package about the size of a postage stamp. It’s 512MB of built-in memory allows the storing of large amounts of map data, allowing users to locate places of interest, i.e. restaurants, pubs, clubs, museums etc, and finding their way about town. Extremely lightweight and ideal for users who require high performance GPS on the move, the SD-502 can be used in a range of navigational and recreational applications. Globalsat’s manufacturing technology along with the cutting edge, SiRF Star III chipset, enabled this latest GPS receiver to provide higher sensitivity, lower power usage and faster time-to-fix! • Based on Bsquare SDIO Now! The SD-502 DOES NOT support PalmOS, Mac 8/9/OSX, or Windows 95/NT/98/ME/2000/XP.